You will be required to login or provide enough information to establish an account. Please enter your username and password and "Login," or click "Sign Up" to create a new account. Use the "Forgot your password?" link to request a password change. NOTE: The system matches unique persons based on name, phone number, and email address. 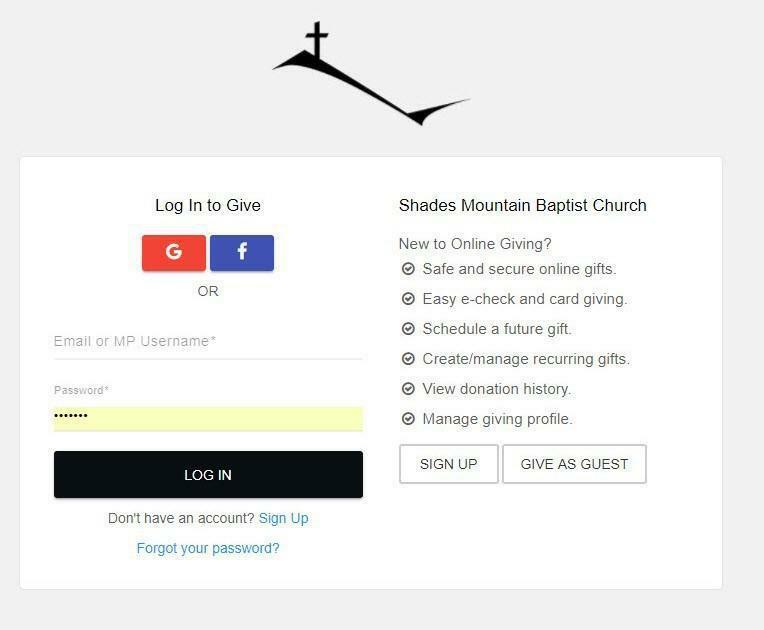 Your giving will be entered completely from one screen. Enter the amount of your gift. Choose ‘one time’ or one of the recurring options (such as monthly, weekly, every 2 weeks, etc..) from the drop down list. Then choose the date of your one time gift or the first instance of your recurring gift. Enter the designation you wish to give toward (budget or missions). If you would like to give more than one gift, choose “+ additional gift” to open another line of giving options. The first time you give, you will be asked to ‘”add a payment method” using the link on the screen. You may choose to pay by credit card or ACH (online check). We accept VISA, Mastercard, and Discover. If you choose ACH you will need your account number and routing number. You may add additional payment methods which will be tokenized for your convenience in future donations. These payment credentials are securely stored by our payment processors and are not stored by Shades. You will also be asked to enter a mailing address the first time you give. This is to identify you in the system and is useful in setting up your account. 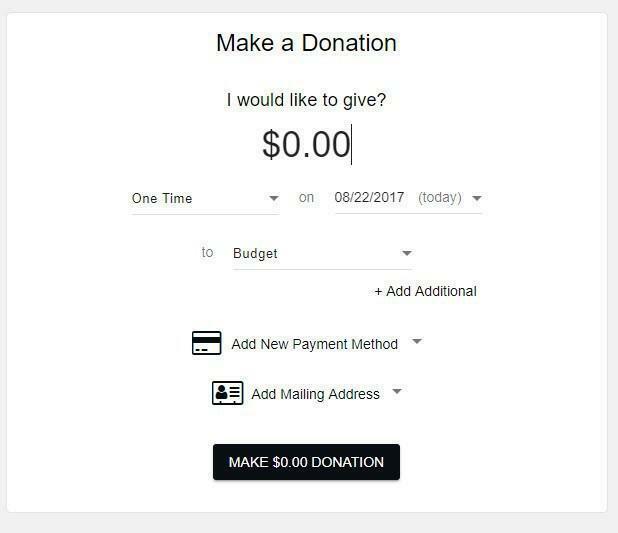 To submit your gift, click the black box at the bottom which says “Make $0.00 Donation”. Your total gift amount will be listed in that box. Upon submission you should receive an email confirmation with the details of your gift along with a message on the screen. This message will ask if you would like to make another gift or make your current gift recurring. In the upper right of the screen you will see “Manage Account”. 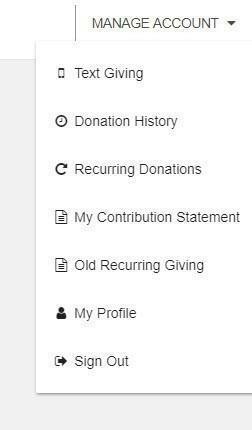 Use drop down list for Text Giving, to see your Donation History, to view or manage your recurring donations, to see a draft of your contribution statement, or to update your profile.